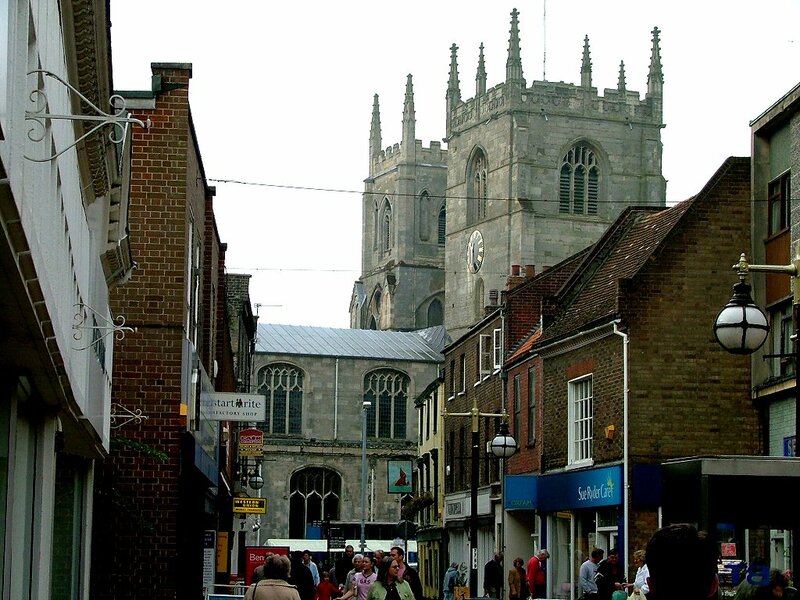 Kings Lynn is Norfolk's third largest town, but it feels bigger than the second largest, Great Yarmouth, because it is so far from anywhere else. 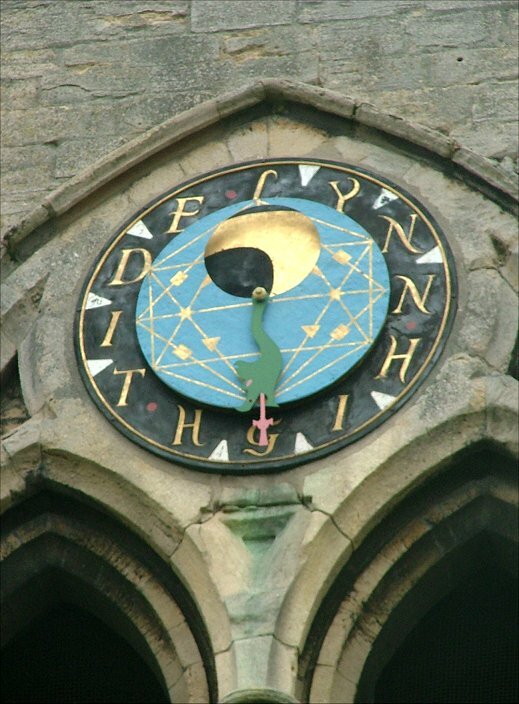 Lynn is proudly and inarguably the centre of its large rural hinterland, the gateway to the Ouse delta and the largest town on the Wash. It is a fascinating town. 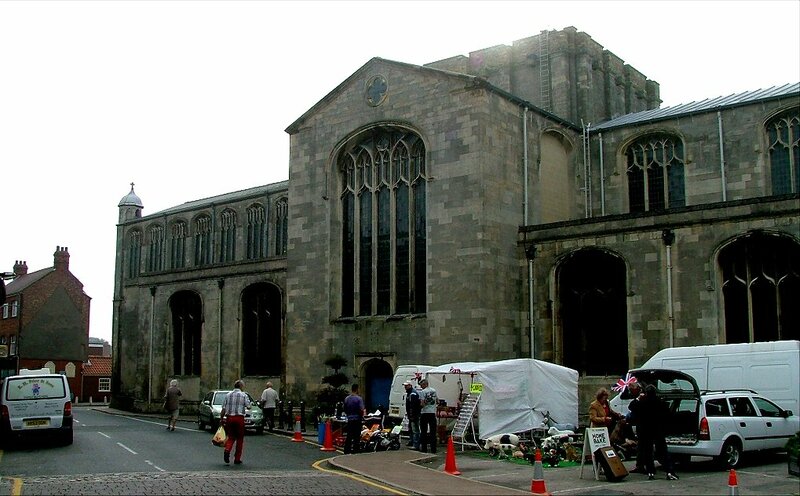 In the middle ages, Lynn was one of the dozen biggest towns in England, and until 1960 or so it could boast one of the finest medieval centres of any town in England. During the course of the next twelve years, about a quarter of this was destroyed, to be replaced by dull, soulless pedestrian shopping concourses; these are now themselves being taken down, and replaced with superstores and car parks. Given that traffic in the town is already horrendous, you might think that they'd be better off trying to keep traffic out rather than attract it. 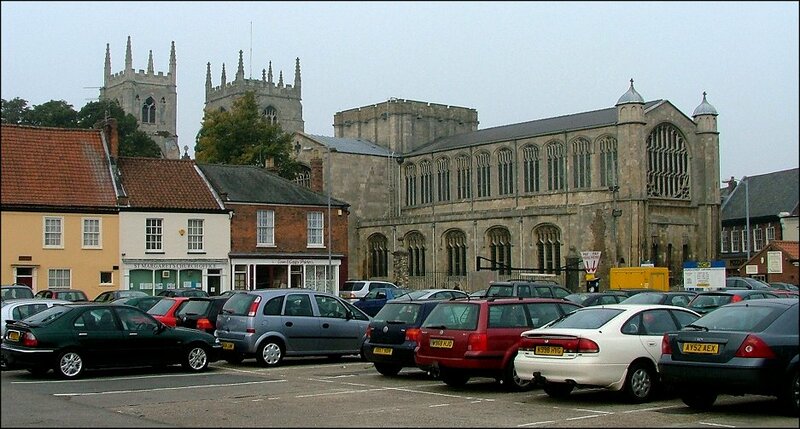 But much remains of Medieval Lynn, and of Georgian Lynn as well, for it was a wealthy merchant town until well into the 19th century. The geography of the town is complex, but satisfying. As the Ouse silted up, the mouth of the river moved westwards, and the town was extended towards it in a series of phases. Parallel with the river front, and several hundred metres from it, the main street connects two open spaces; at the north is the wide square of the Tuesday Market, and at the other is the more cluttered Saturday Market. 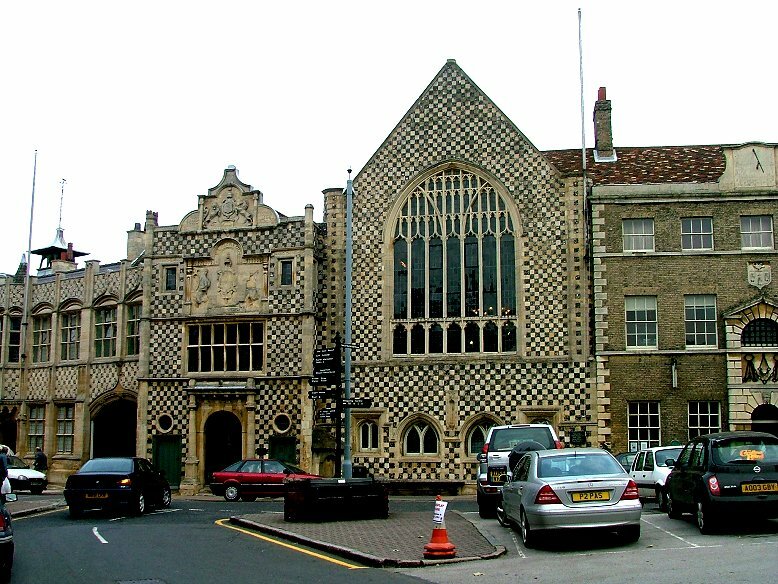 This was the heart of the town at the end of the medieval period, and contains the finest buildings, including the magnificent 16th century guildhall. 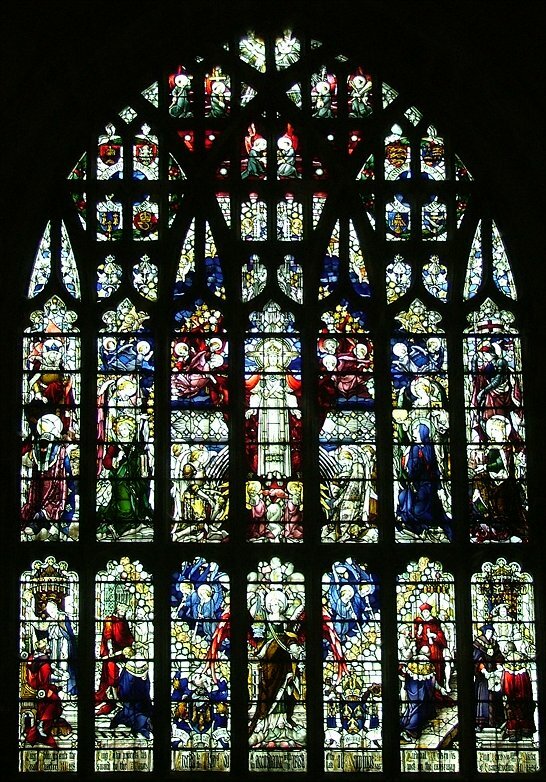 Opposite is the vast bulk of St Margaret. 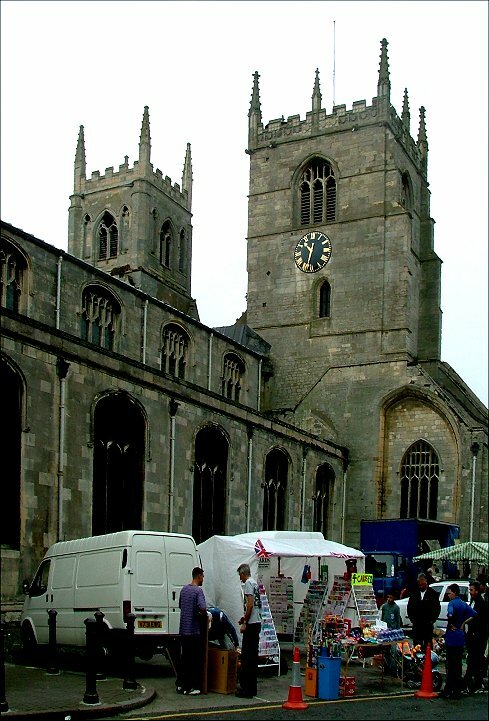 The church's three towers rise high above the Saturday Market and the narrow streets around, the huge bulk of the nave and chancel brooding at the ends of openings, new and intriguing vistas presenting themselves. 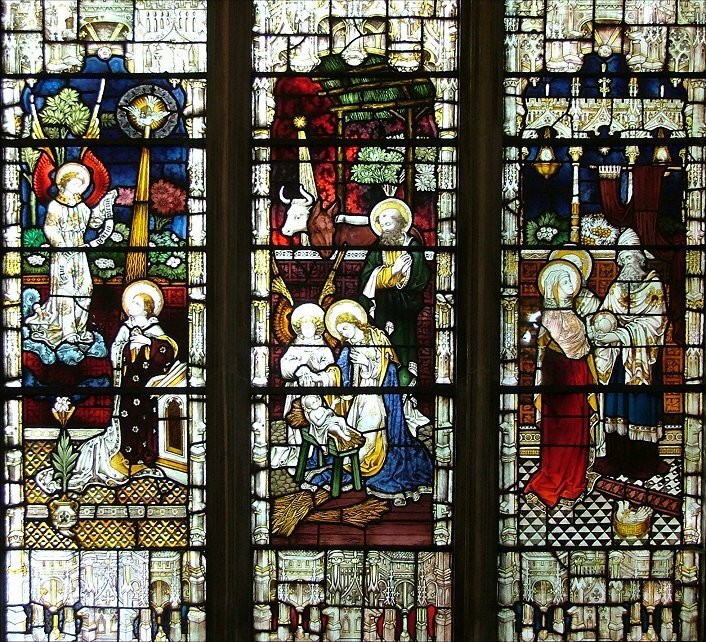 It is one of the finest urban medieval moments in England. 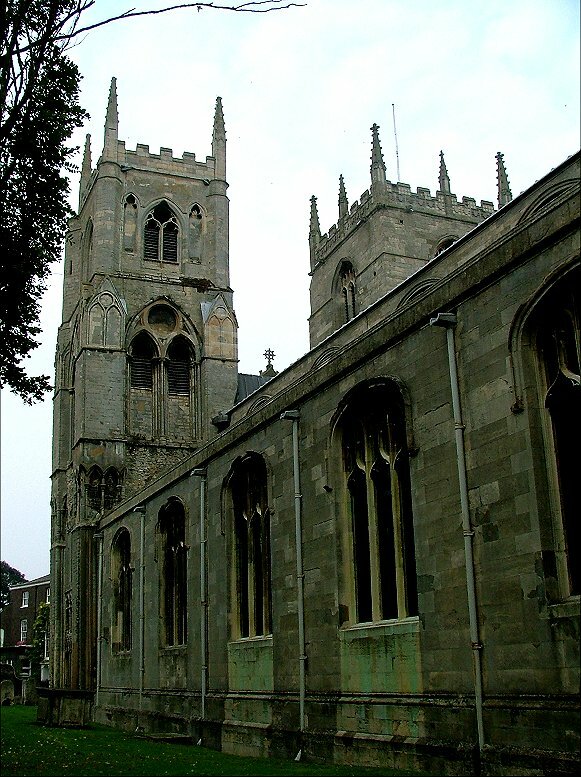 St Margaret is far bigger than any of the Norwich medieval churches, and is second in size in East Anglia only to St Nicholas at Great Yarmouth, which is the largest medieval parish church in England. 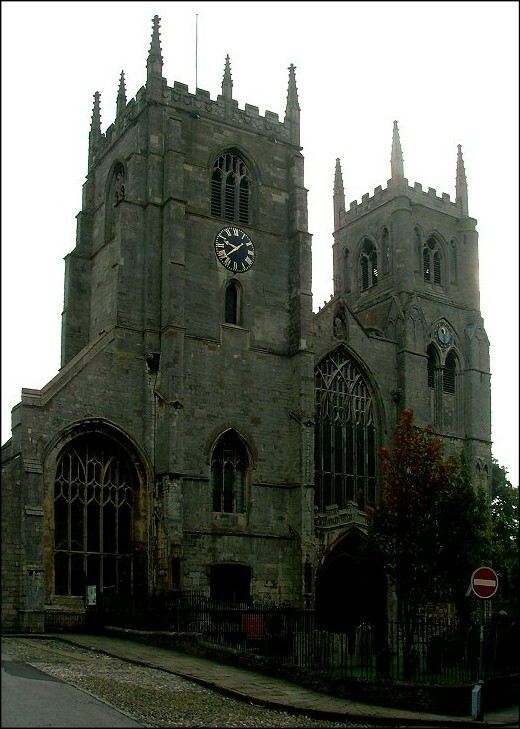 From the west, the overall layout consists of two western towers separated by a west front, a clerestoried and aisled nave, a central tower above a crossing with transepts, and a clerestoried chancel. 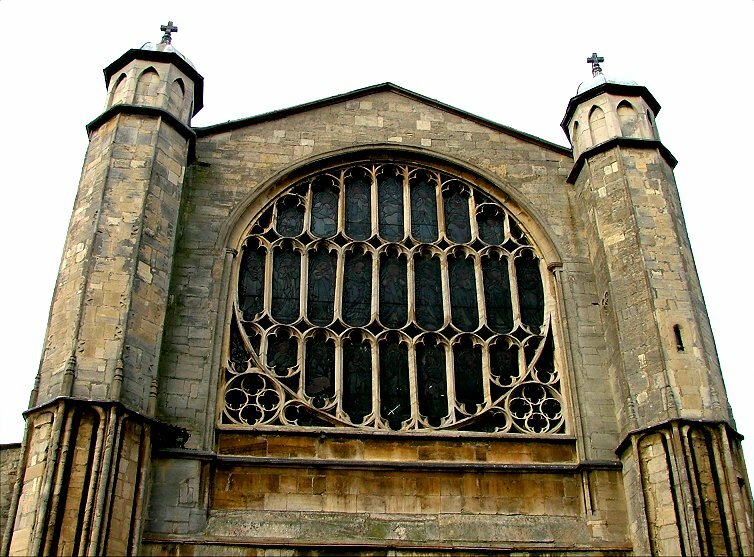 Pevsner, who has measured it, tells us that the building is 235 feet long from end to end. To understand it, it is best to consider the order in which it was built. 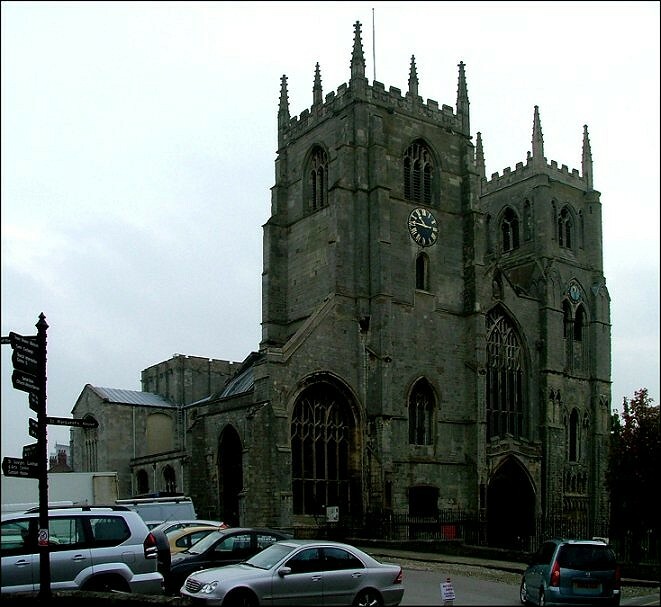 A Norman Priory church came first, probably on the site of the present nave, but little trace of it survives. 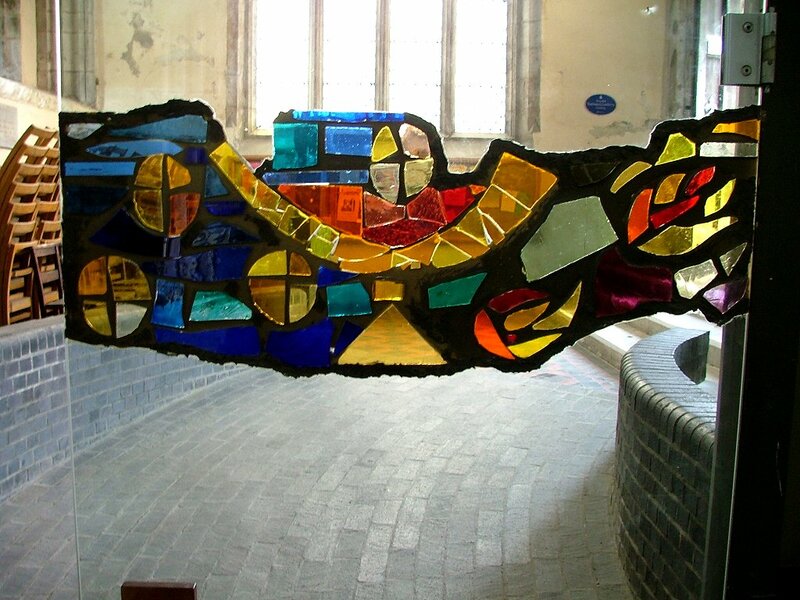 The Priory was founded in 1101, five years after Norwich cathedral, by the same man, Herbert de Losinga. 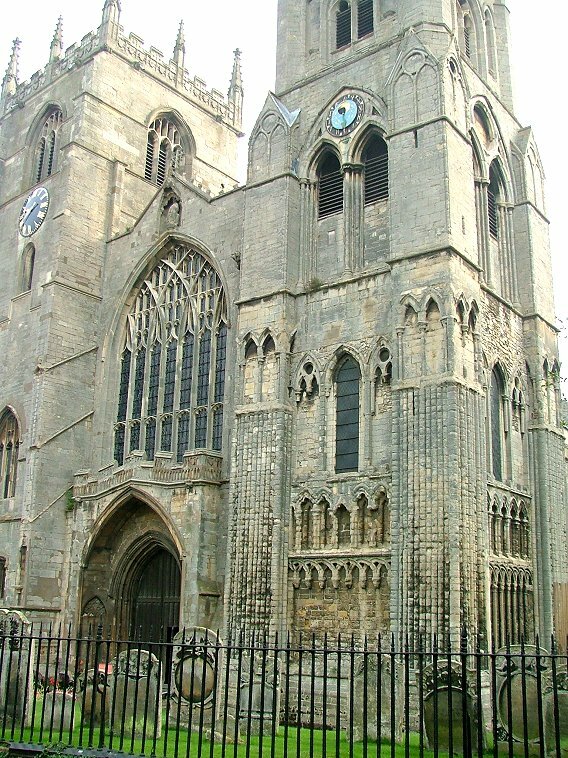 The Priory's fortunes burgeoned, and about the middle of the 12th century the two massive towers were begun at the west end. They would take almost a century to complete. 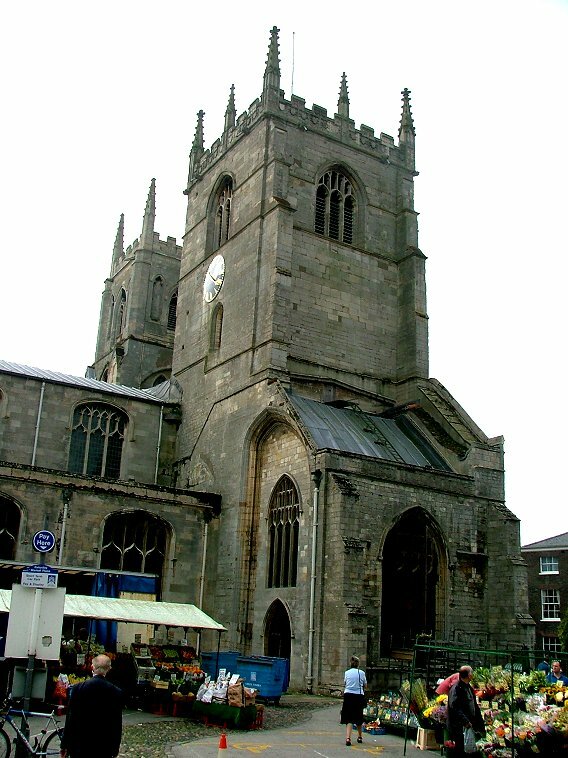 The south-west tower is pretty much in its original form, changing from Norman to Early English as it climbs. 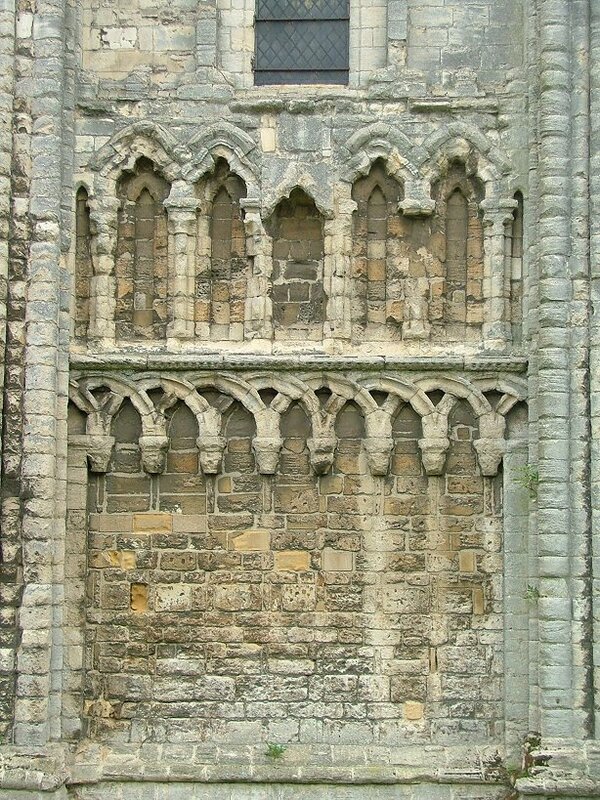 The tower to the north-west was either not completed, or was for some reason taken down and replaced, because what we see today is largely the work of the 15th century. It would continue to cause trouble, as we shall see. 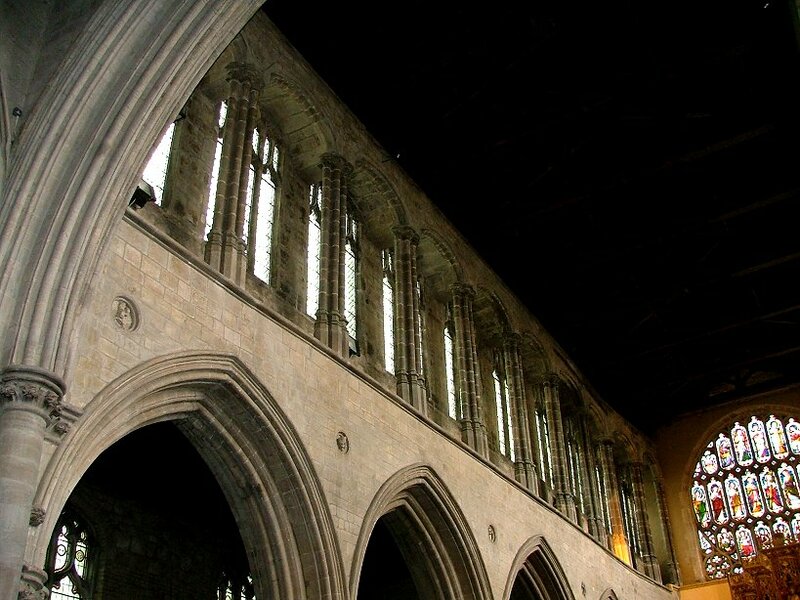 In the 13th century, the body of the church was rebuilt, the vast chancel being added in the height of the Early English style, with a walkway in the clerestory. 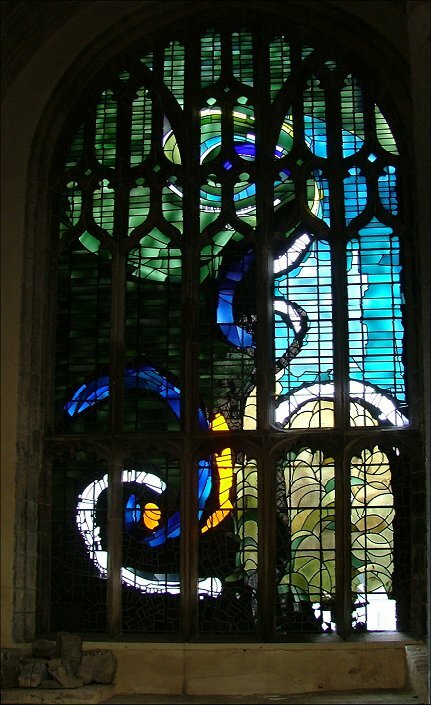 The east window was added in the 15th century; it is a curious rose shape, although we need to be aware that it was reconstructed by Ewan Christian as part of a 19th century restoration. 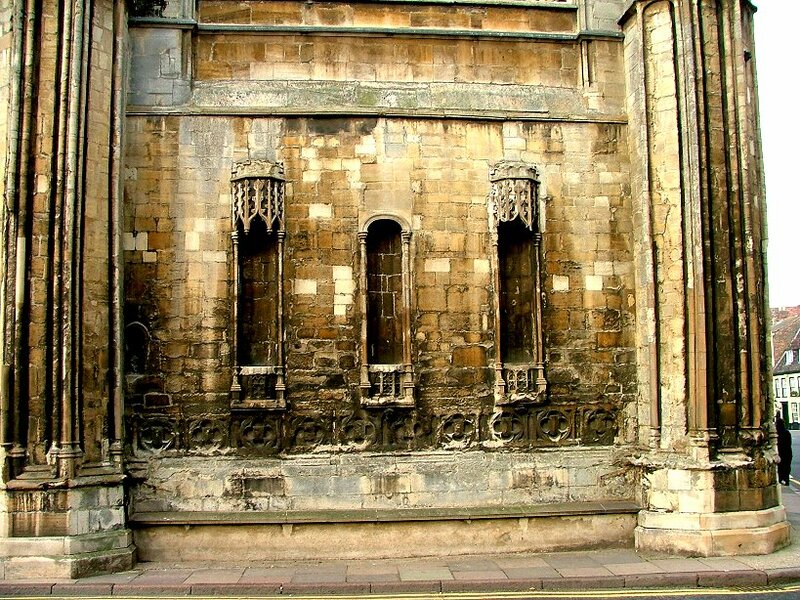 Beneath it, in the external east wall, are three large and elaborate image niches, which may have contained a rood group. 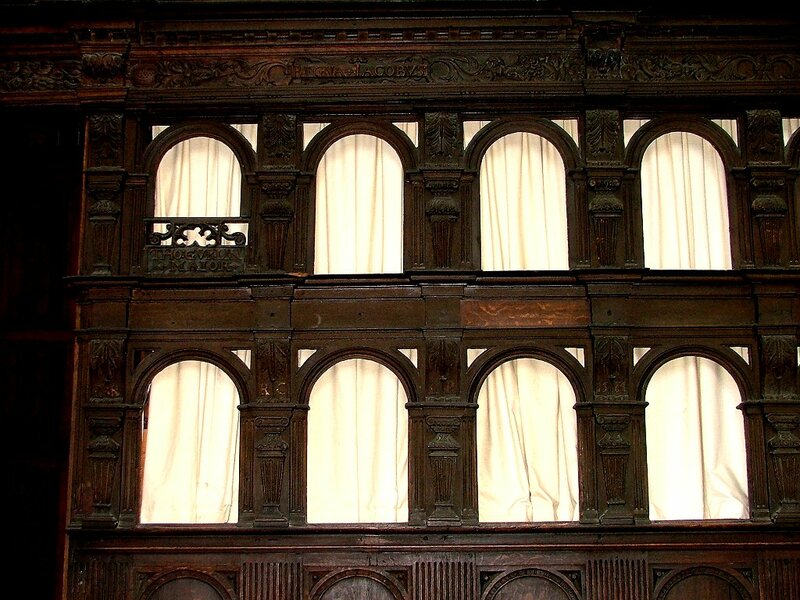 Because of the layout of the town, this east front is hidden away in a narrow side street, and is easily missed. 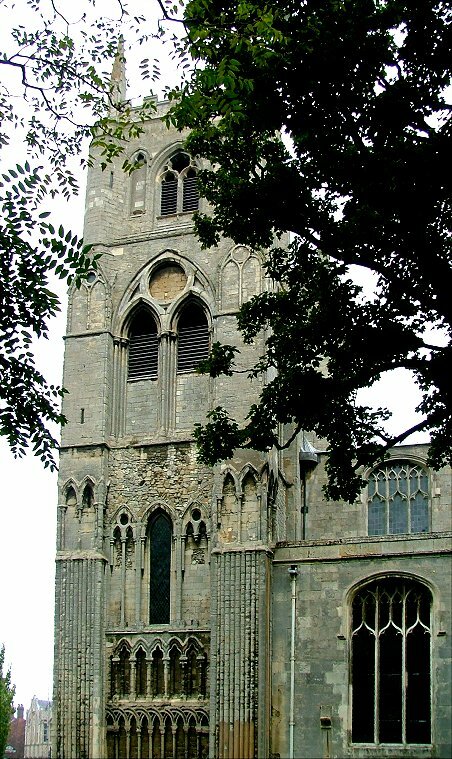 Also in the 15th century, the crossing tower was surmounted by a lantern, probably a bit like that at Ely cathedral, 20 miles away. 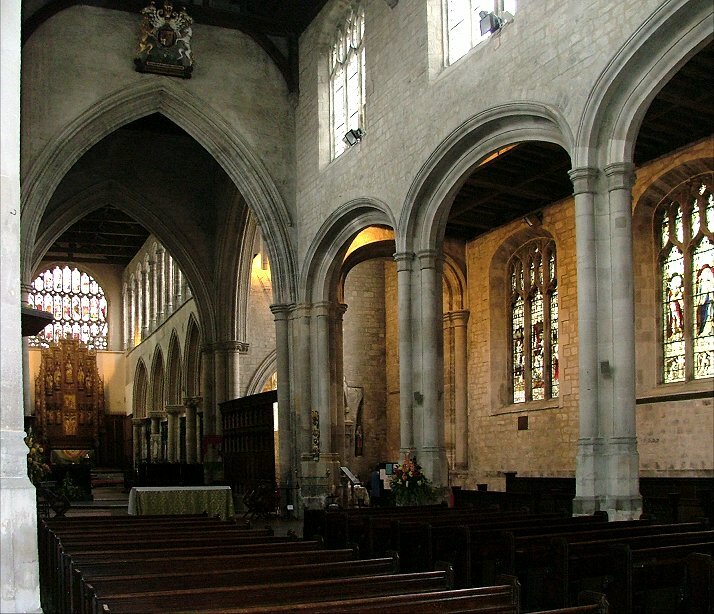 The nave was completed, and the upper exterior of the chancel was redone, retaining the internal structural features. 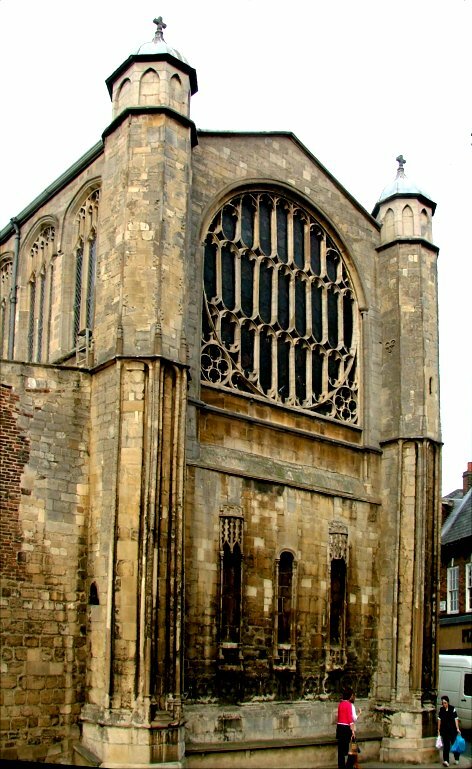 The west front with its porch and massive window was completed, as was the north-west tower. 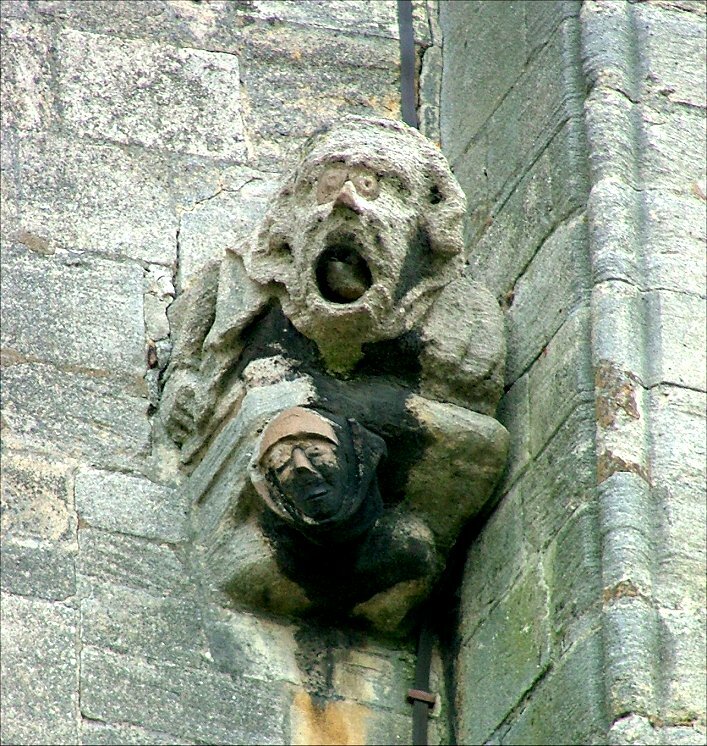 Both towers were surmounted by steeples, and the church was now at the peak of its glory, spired, battlemented, replete with gargoyles and grotesques. It must have looked like a cathedral. 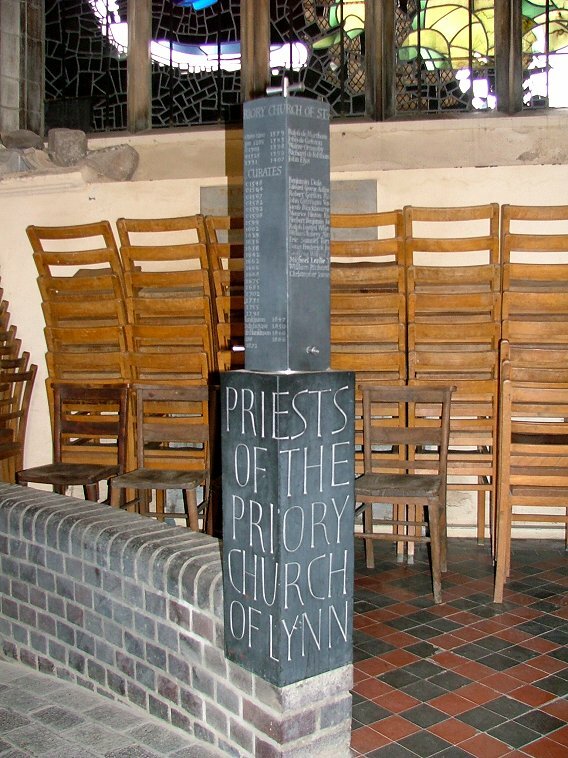 The Priory was dissolved along with all the others in the 1530s, and after the Reformation the church fulfilled its new role as a large, urban protestant preaching space. 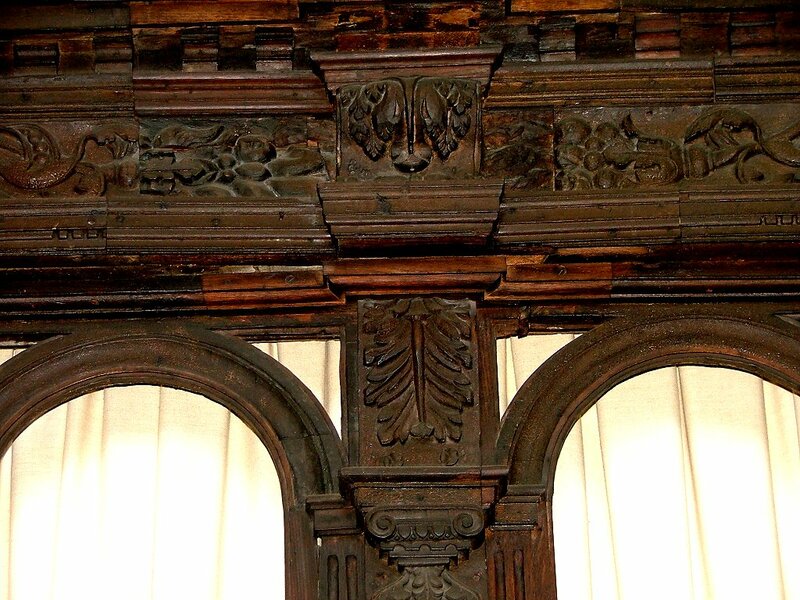 The lack of emphasis on the upkeep of buildings in the 17th and 18th centuries served it ill, however. About midday on the 8th of September 1741, the spire and the top of the north-west tower came down in a storm, right into the heart of the nave, pretty much destroying it. 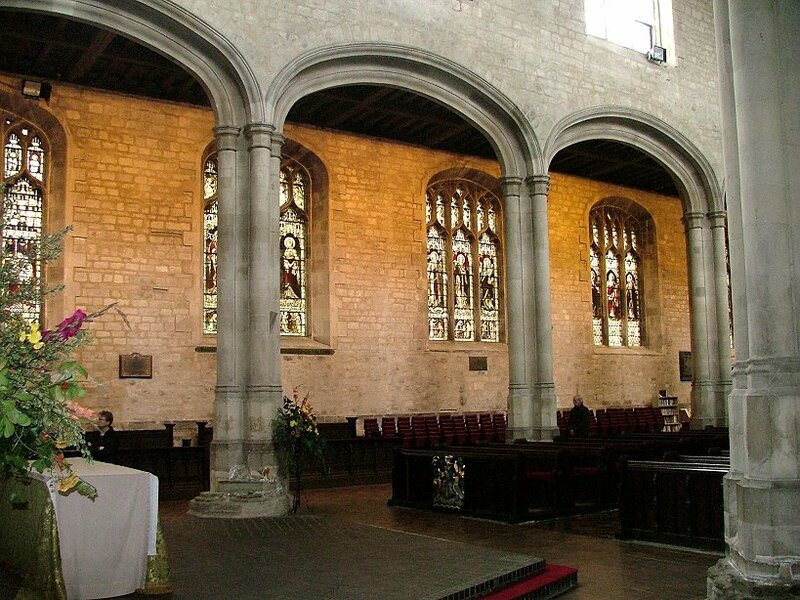 It took five years to replace the ruined nave, during which time the congregation retreated into the chancel. The rebuilding was the work of the architect Matthew Brettingham, most famous for Holkham Hall. 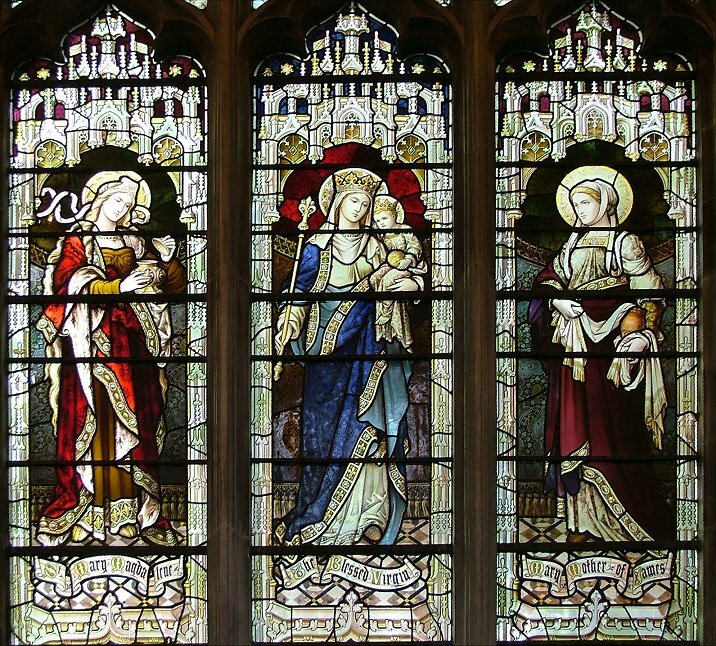 Perhaps because country houses were being fashionably designed in a kind of proto-gothick at this time, Brettingham used the same language for the nave of St Margaret; intelligently, because there was no liturgical imperative for the aisles, arcades and clerestory. 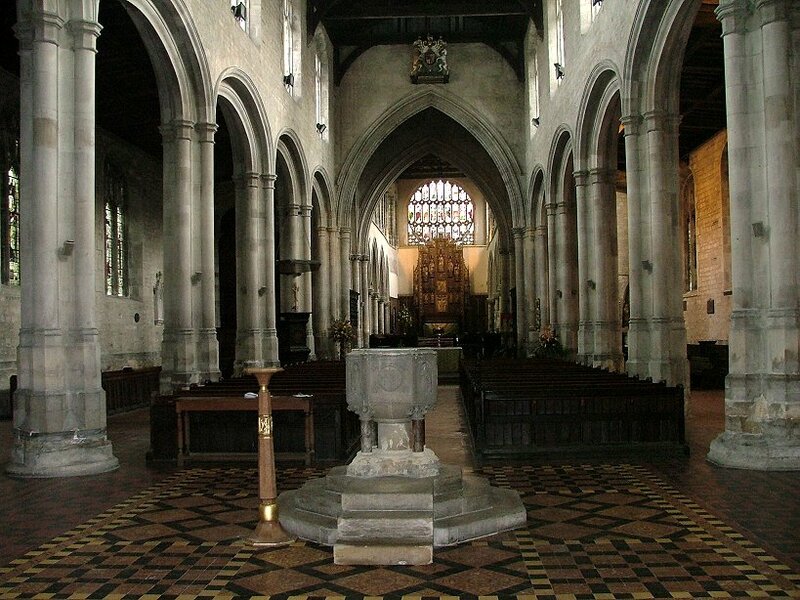 The result is curiously modern, a smoothed-off Gothic with wide, languid arches and elephantine pillars. 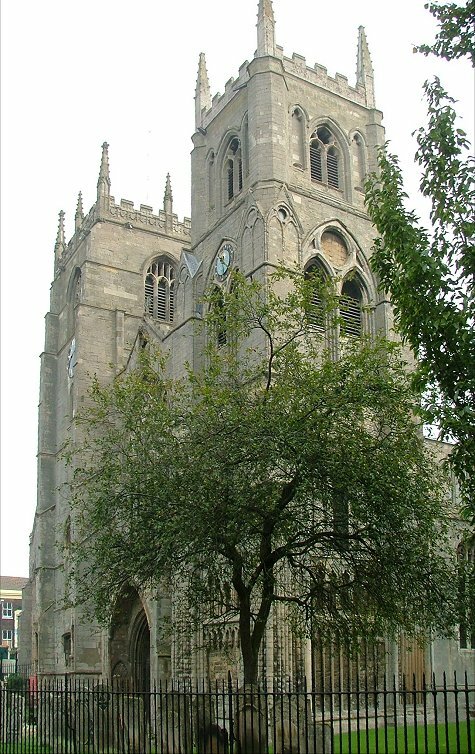 The lantern tower was removed, as was the spire on the south-west tower. 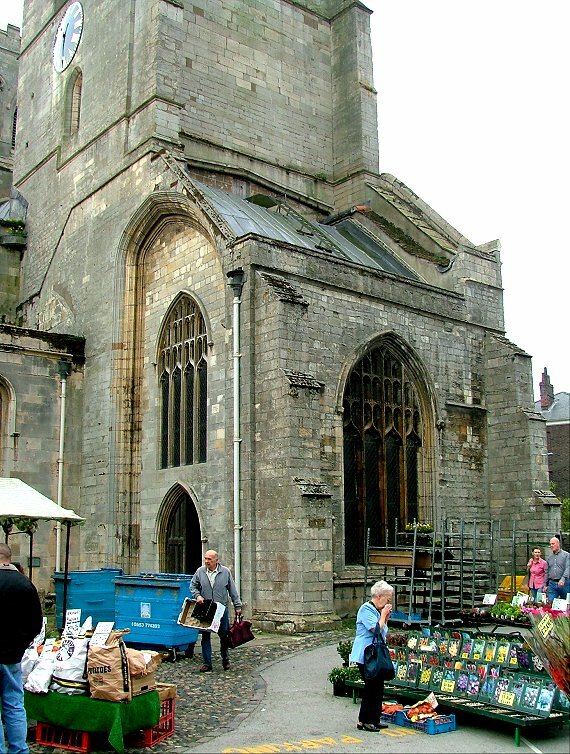 Externally, that was pretty much it; the Victorians tarted up the transepts and removed a row of shops that had been built on to the north side (hence the curious north porch with its tall arch to the east). 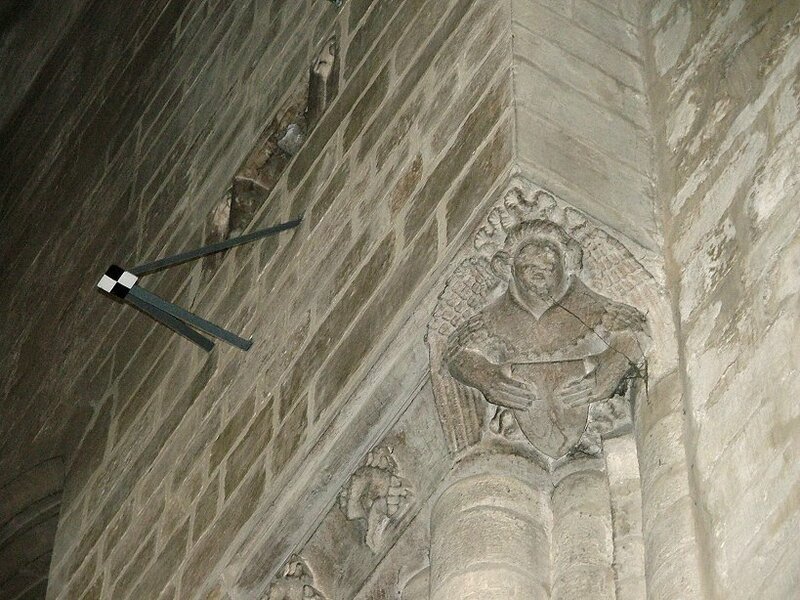 The clock on the south-west tower shows the time of high tides. And so, to the inside. This is one of the most welcoming of all urban churches. It is open everyday, and the people greet you warmly as if they're really grateful that you've come; which they probably are, because Lynn is a socially deprived area and benefits from tourism when it can. 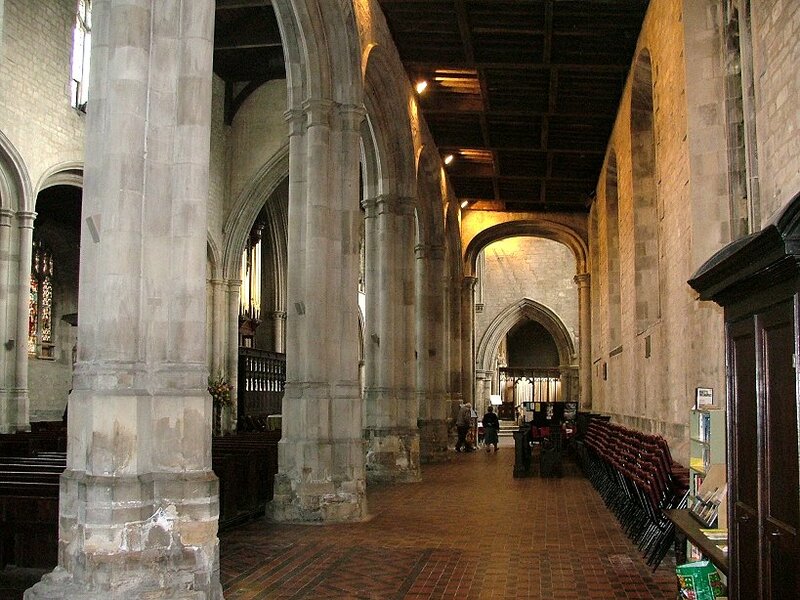 There is a little cafe in the south transept where you can get a cup of tea and a bun. 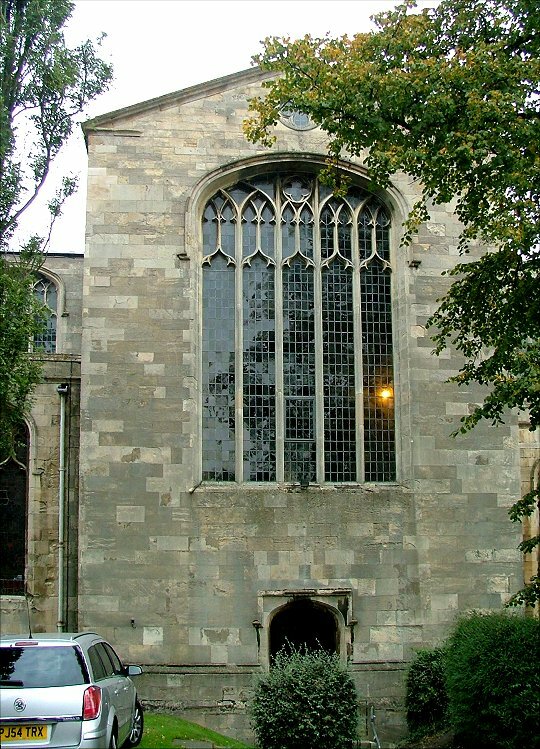 It is possible to enter from the north porch, which is done out really well in a full-on 1960s style in modern glass and slate. 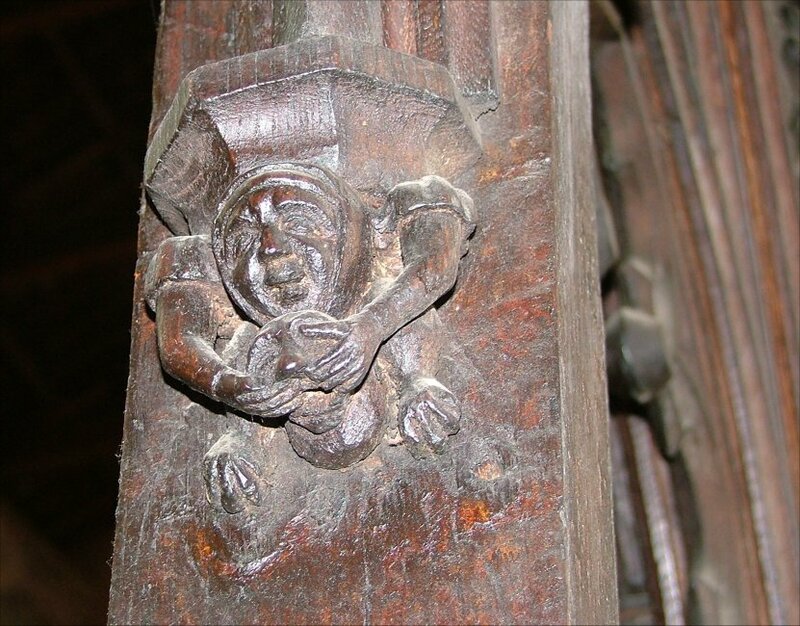 You certainly should not miss this, but for the full effect it is really important to enter St Margaret for the first time through the west doors. 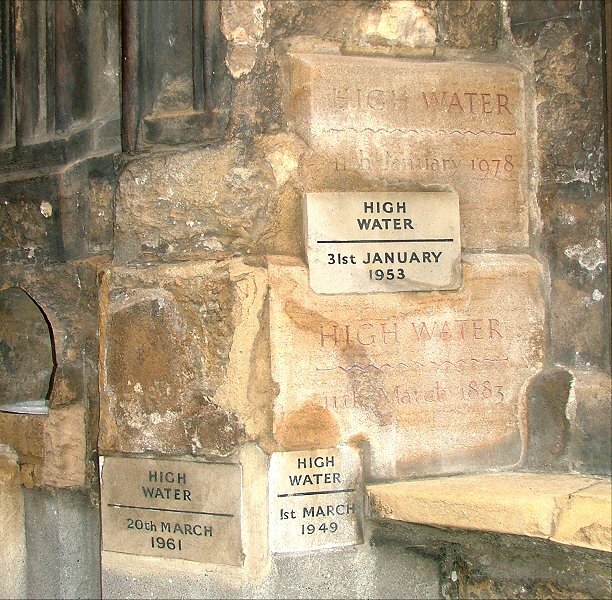 As you go in, notice on your right the markers that record successive town floods in the 19th and 20th centuries. You step into a vastness that swallows all sound. The arcades stretch away into the distance like a forest glade, and you will see straight away that, as little as the Victorians found to do outside, no effort was spared by them internally to bring the church up to scratch. 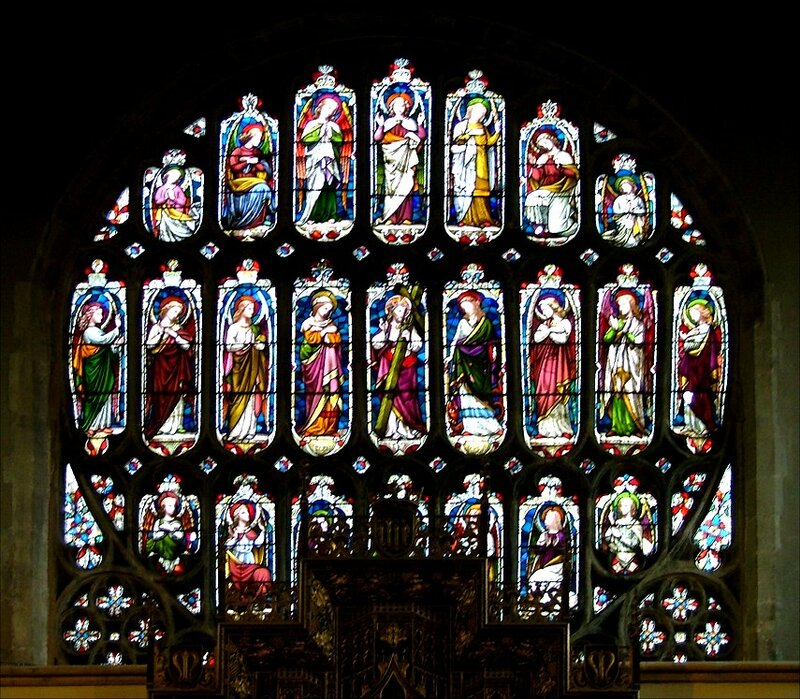 An acreage of shiny encaustic tiles spreads before you, and the windows to north and south are all full of Victorian glass, most of which depicts Saints, but only some of which is good, I'm afraid. 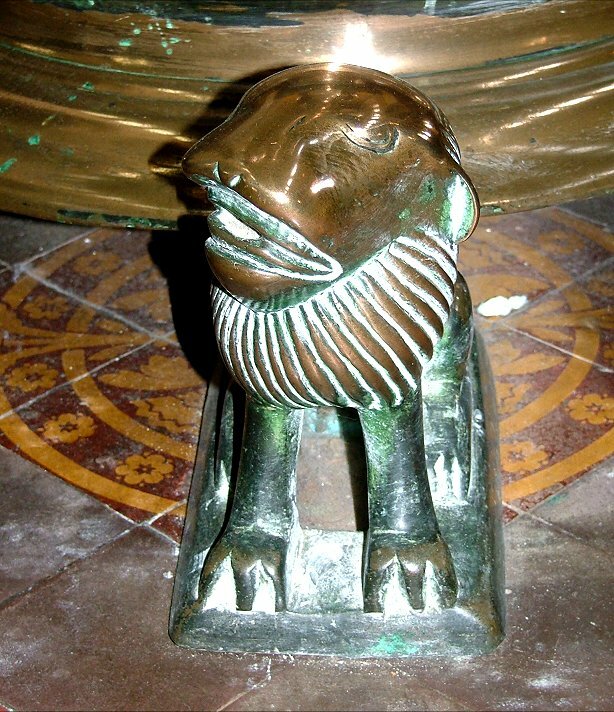 George Gilbert Scott was responsible for the restoration of the nave, and the font is, again, not the best example of 19th century work, although it looks rather imposing on its high pedestal. 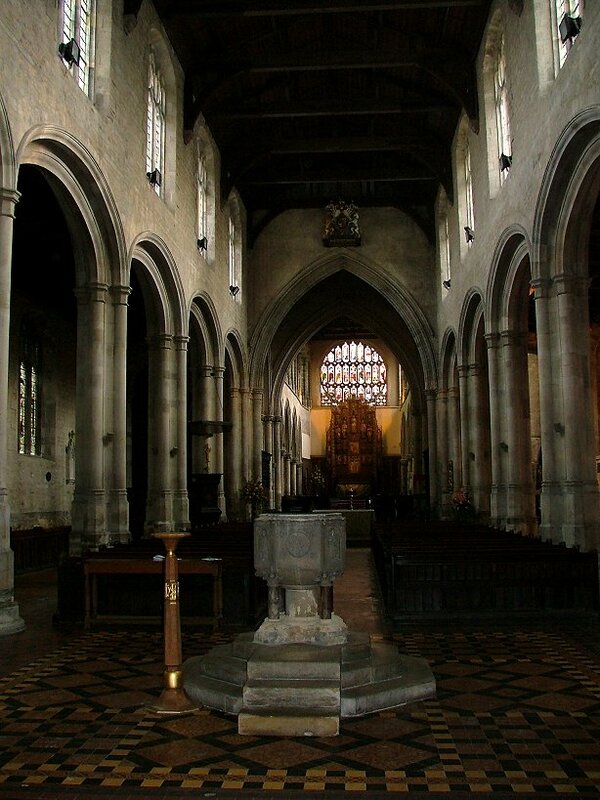 However, be patient; the nave is not St Margaret's best feature. 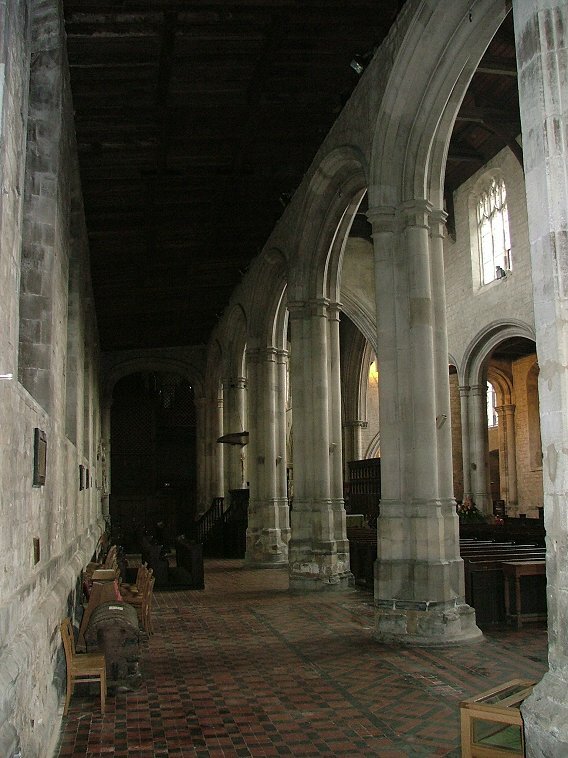 Brettingham had raised the nave floor, and when Scott lowered it again he revealed the bases of the original pillars of the arcades, which are curiously elaborate, like elephants feet, under Brettingham's columns. 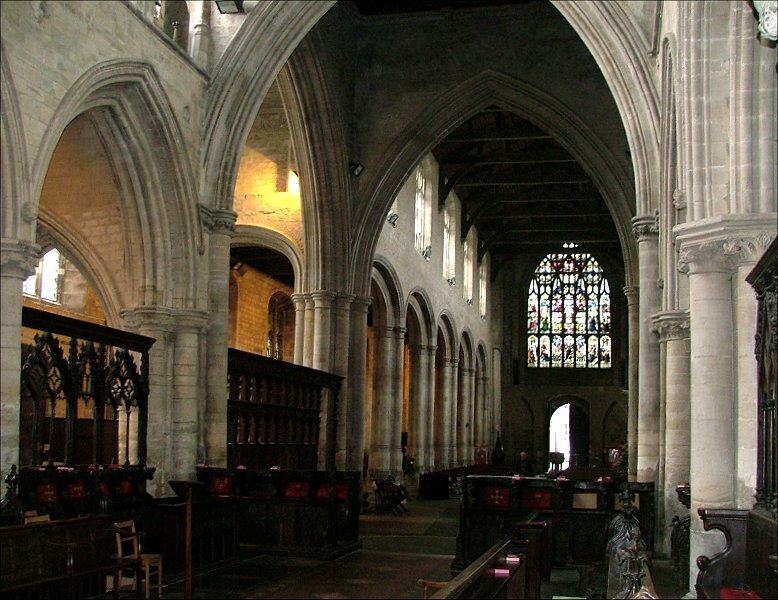 The nave is a good place to wander; it is not a complex space, but each vista is pleasing, and some are of interest; note the way that the west end of the south aisle ends in a Norman arch, and you can see the roofline of the original Norman church above it. 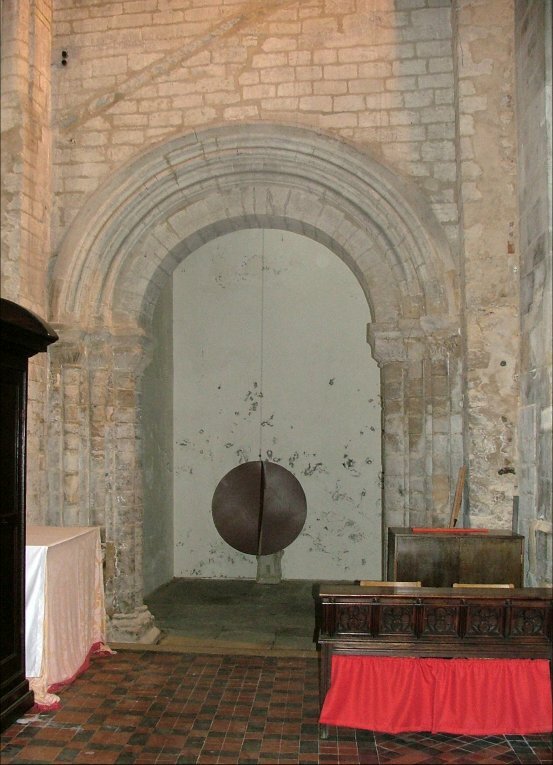 There is a massive Norman pillar and arch facing south from the base of the north-west tower. 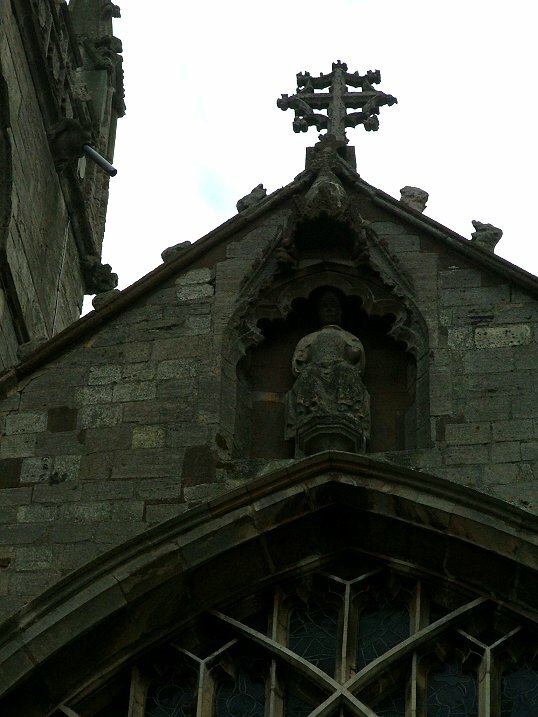 The soaring chancel arch is surmounted by a Charles II royal arms, which looks a little lost up there. 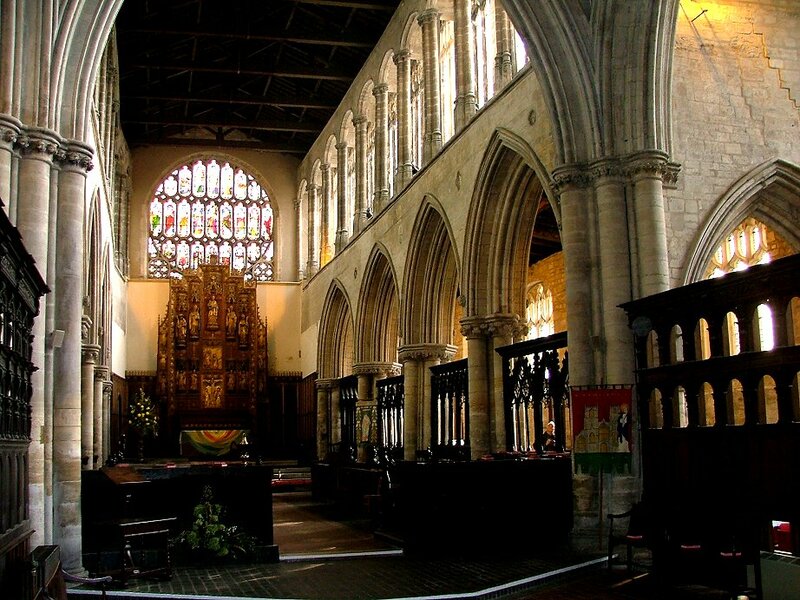 You step beneath the chancel arch and immediately it gets more complex and more interesting; you wonder at what must have been lost in the nave. 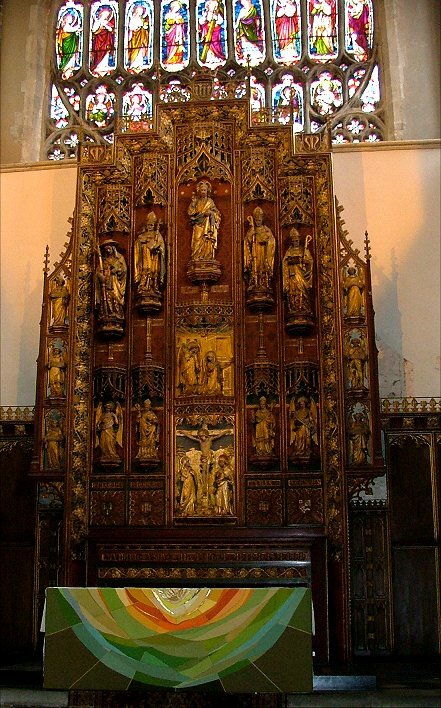 Now the eye is drawn by Bodley's 1899 reredos, a glorious Flemish-style confection of angels and Saints. 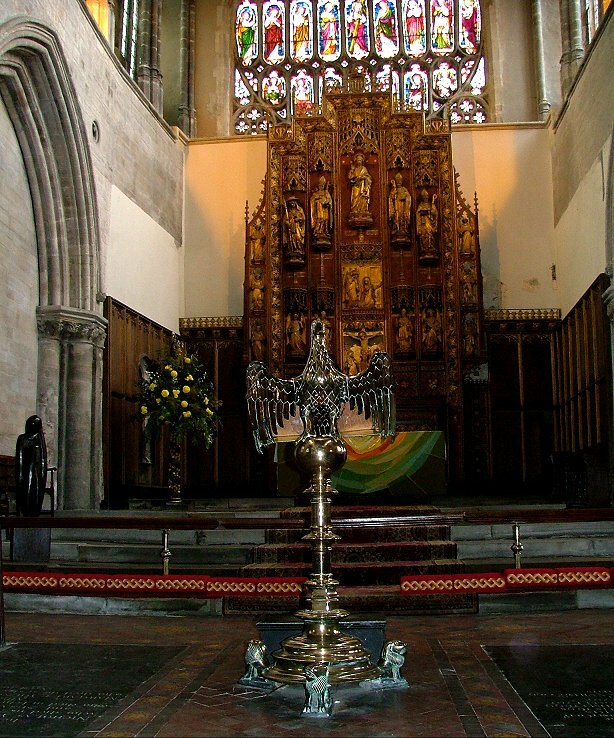 In such a large sanctuary it does not impose as it would in a smaller church, instead providing a backdrop to the complexities of the chancel. 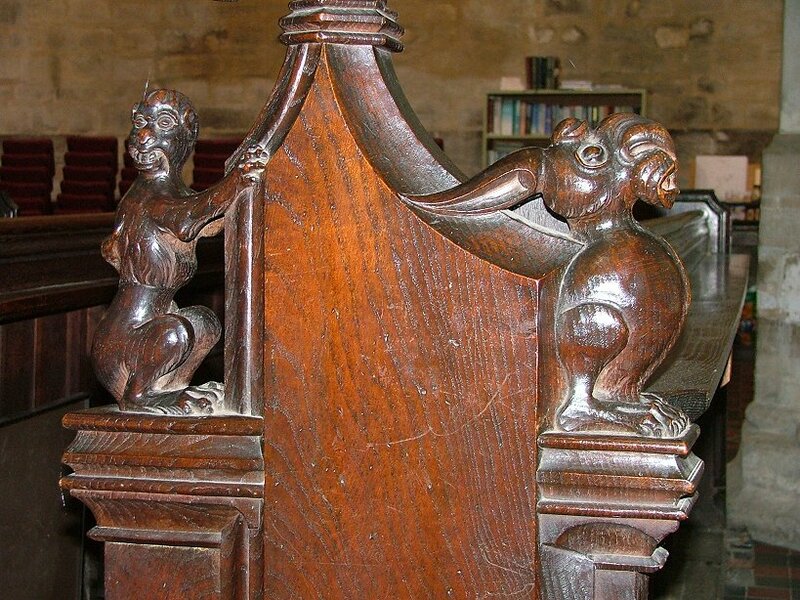 In the middle of the chancel is one of those big latten eagle lecterns with lion feet, so familiar from this part of Norfolk. 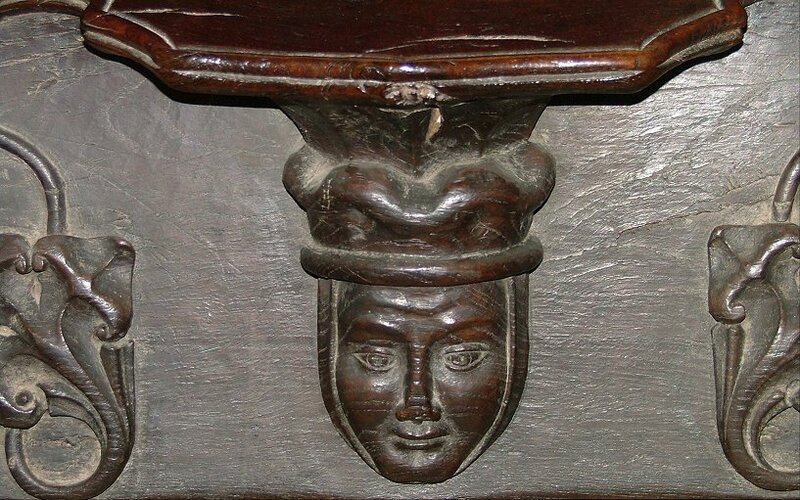 This is the best of them, I think, being from the same workshop as the one at Redenhall. 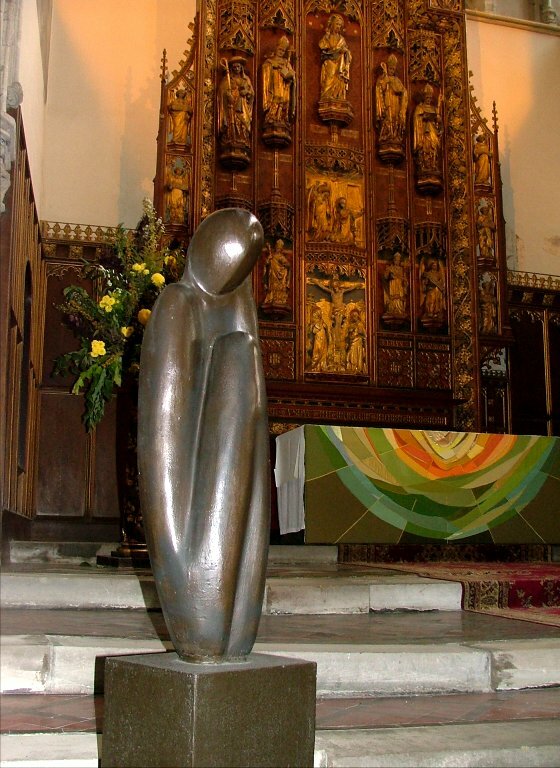 A modern sculpture of the Blessed Virgin and child has been intelligently placed to the north of the sanctuary. 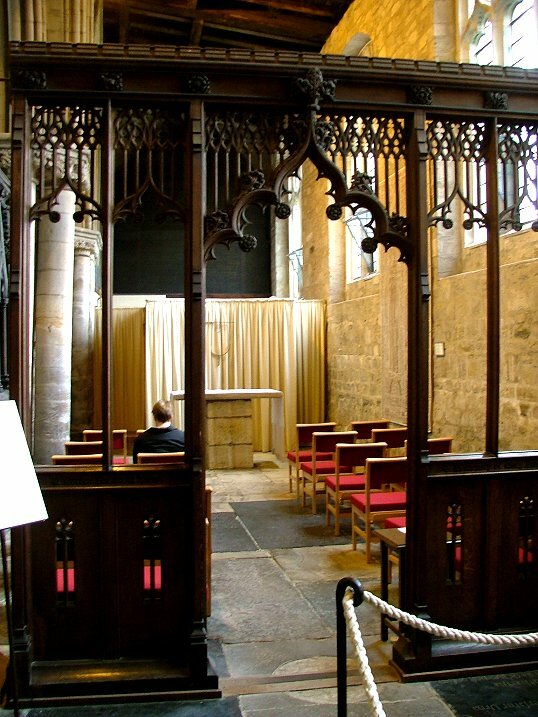 Again, the hugeness of the space means that nothing dominates, and allows you to take in the whole chancel with all its details. Most striking of all is the clerestory. 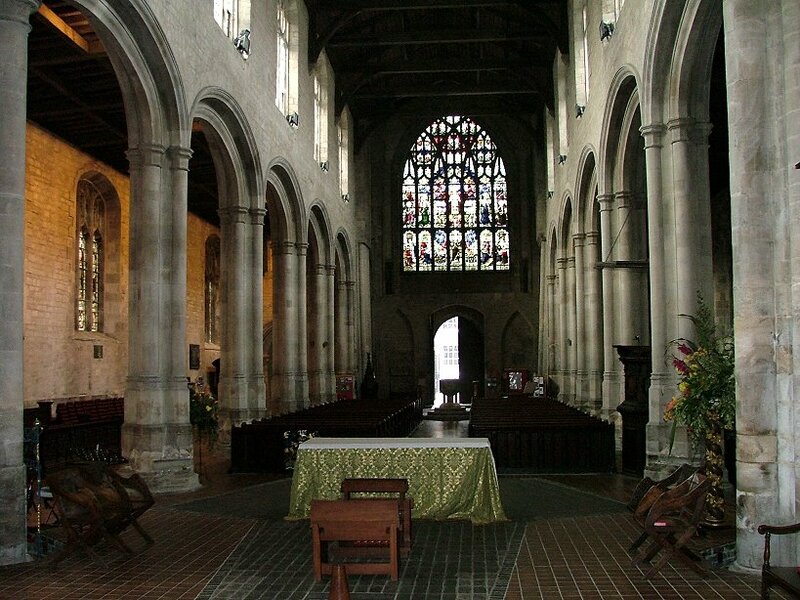 Unusually, it has a walkway within it, the inner pillars being 13th century and the exterior windows 15th century, so the arrangement must have existed from the start. 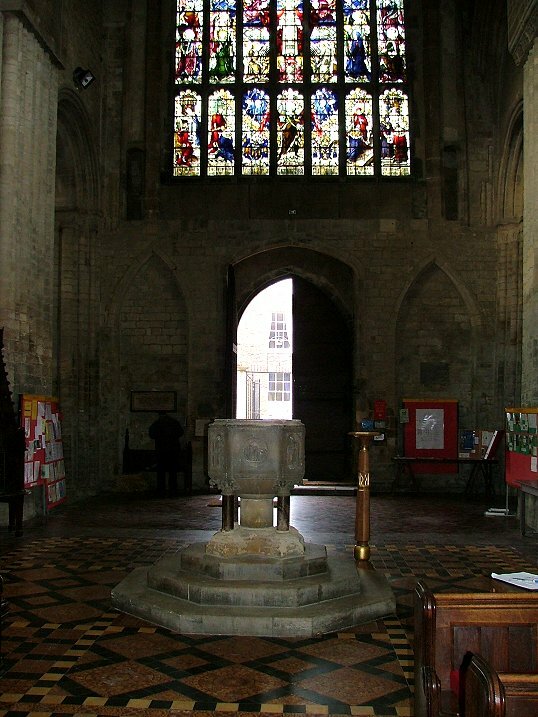 The south chancel aisle extends to the east end, tapering slightly, while that to the north is truncated. 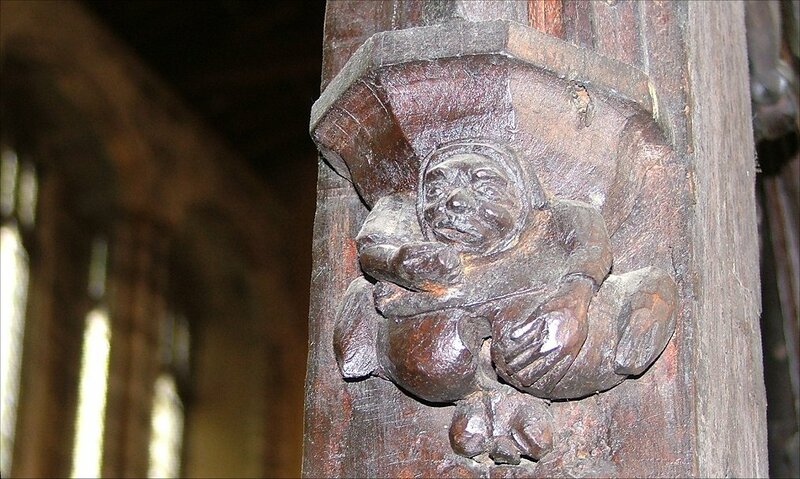 The aisles are separated by some of the most elaborate screens in any Norfolk church, wonders of intricate and characterful carvings. 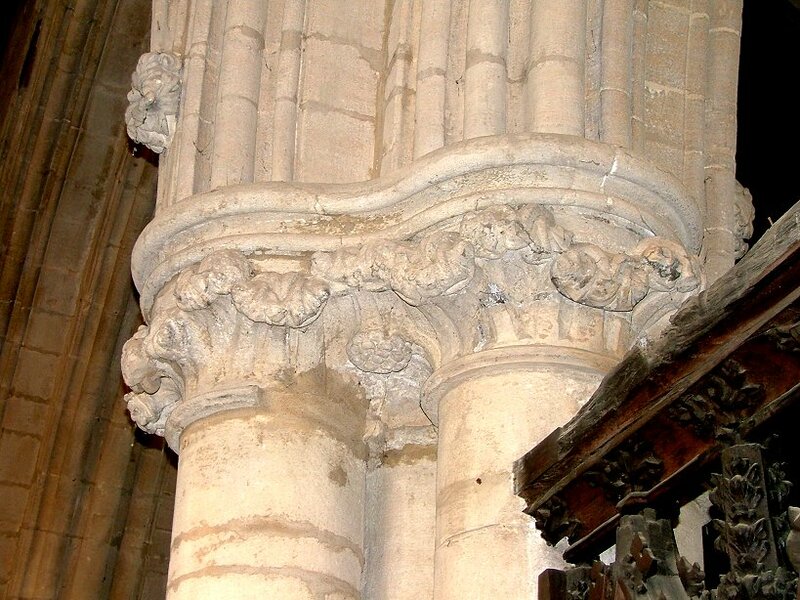 In particular, the little figures that form the conceits of tiny corbels to the arcading. 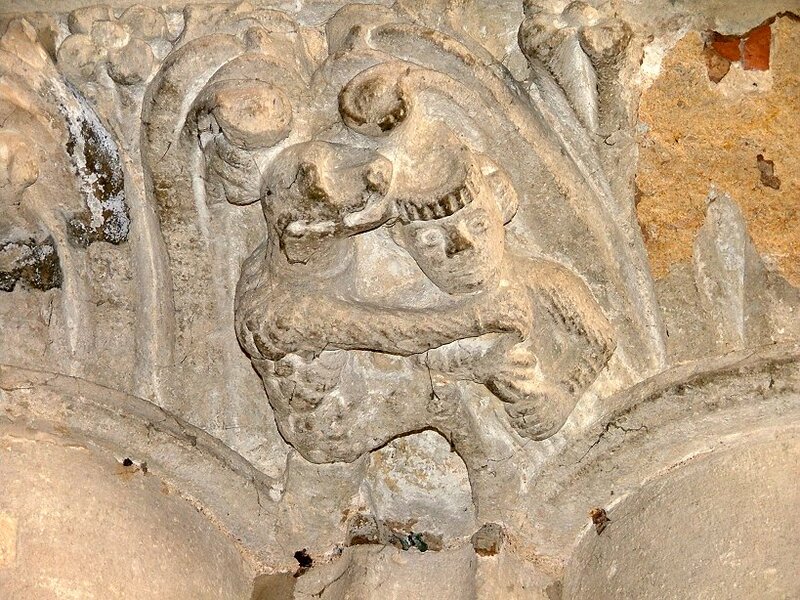 The best date from the early part of the 14th century. 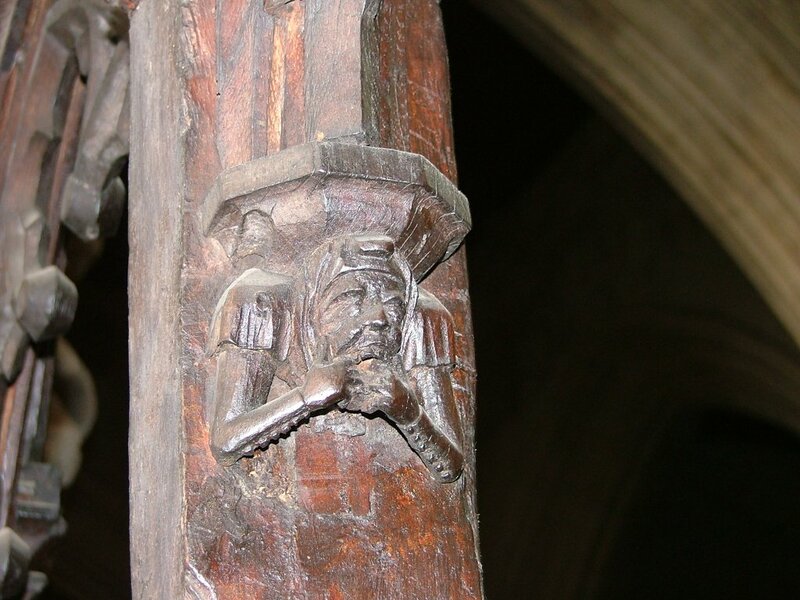 The capitals to the arcade are also full and elaborate, full of intricacies. 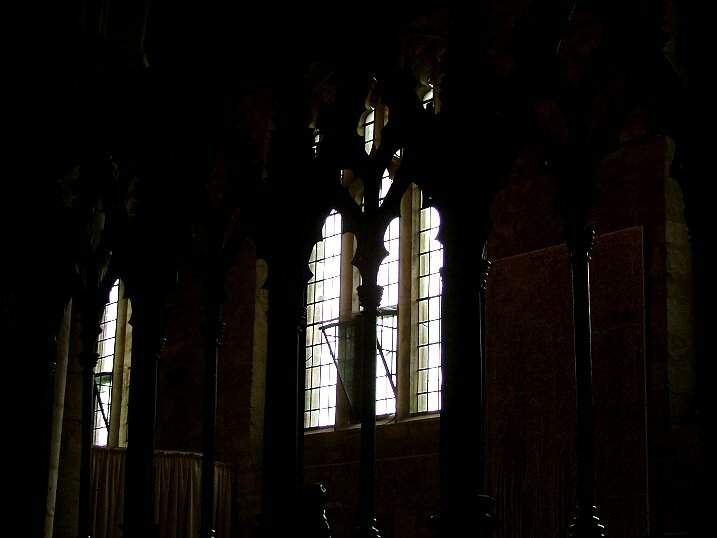 Shadowy beyond, the chancel aisle chapels are secretive places, each furnished in a modern style for private prayer. 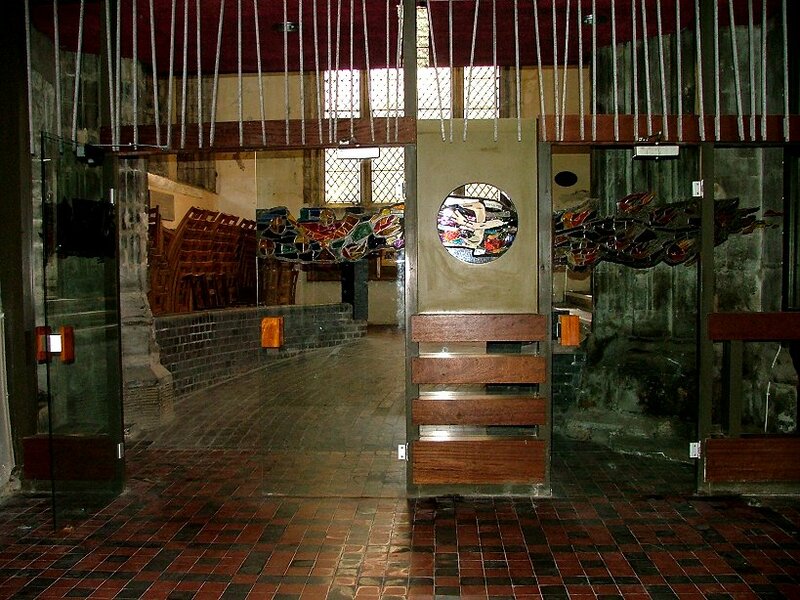 Ewan Christian was responsible for the 19th century restoration of the chancel, and it was much more successful than Scott's work in the nave; even the encaustic tiles lend a sympathetic rigor to the place, as if acknowledging that this is the business place of the church. 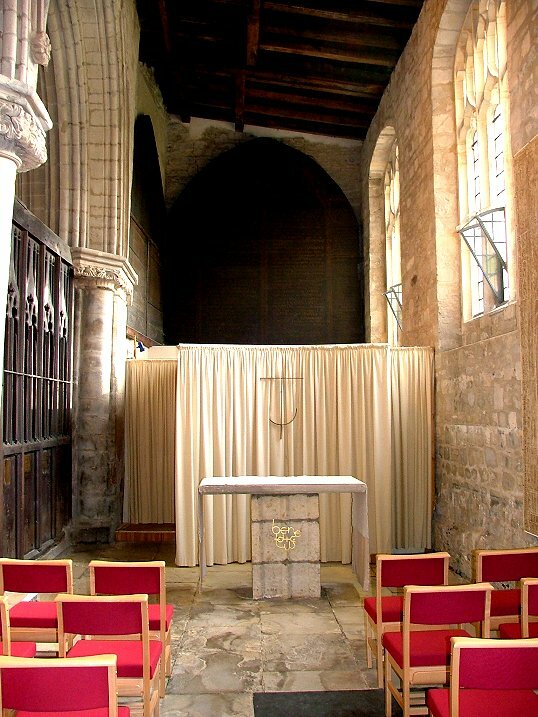 There are reminders of the Priory status of St Margaret before the Reformation; return stalls with misericord seats fill the western part of the chancel. 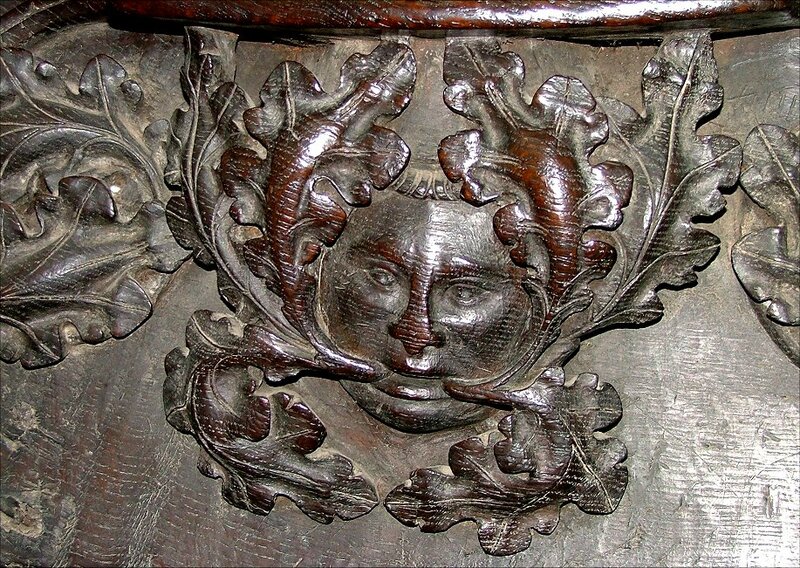 The best of the seat carvings features a mysterious green man, but all the heads are full of 14th century confidence. Coming back into the crossing, there is another screen which is equally remarkable in its own way. 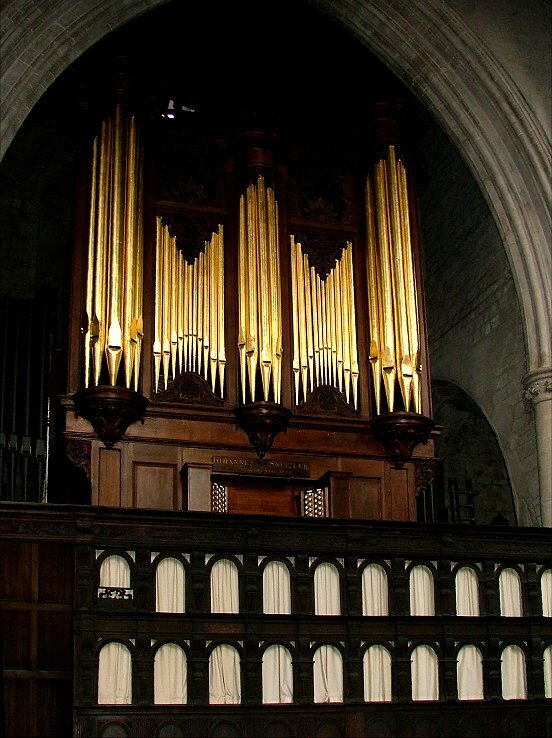 This is across the north transept, which now houses the 1754 organ. 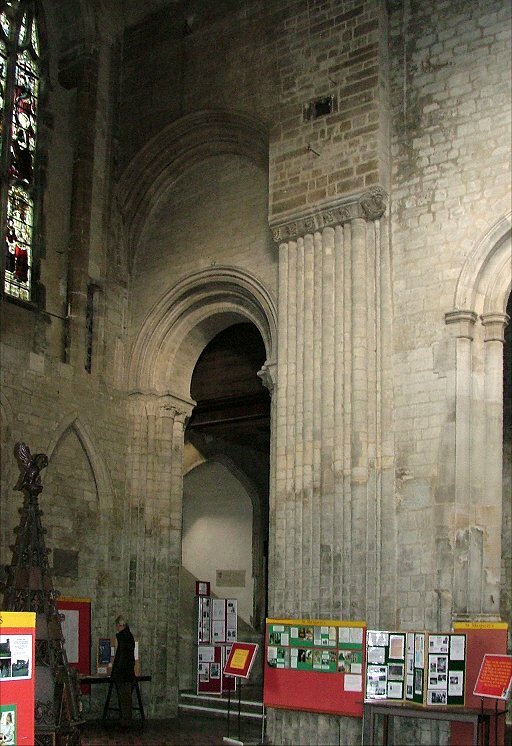 The lower part consists of blank arcading, while above there are two levels of open arches. 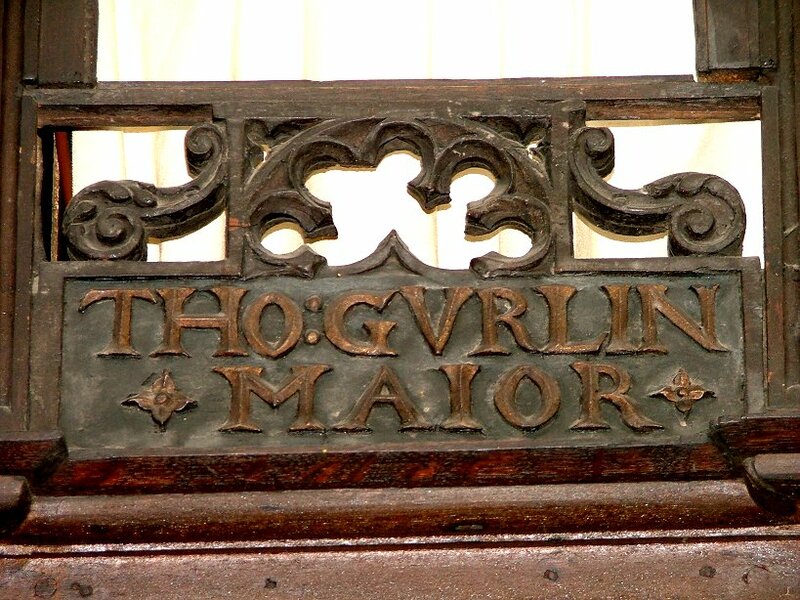 It is dated 1584, but as well as Thomas Gurlin, the mayor, who was perhaps the donor, it also records James I becoming king in 1603. 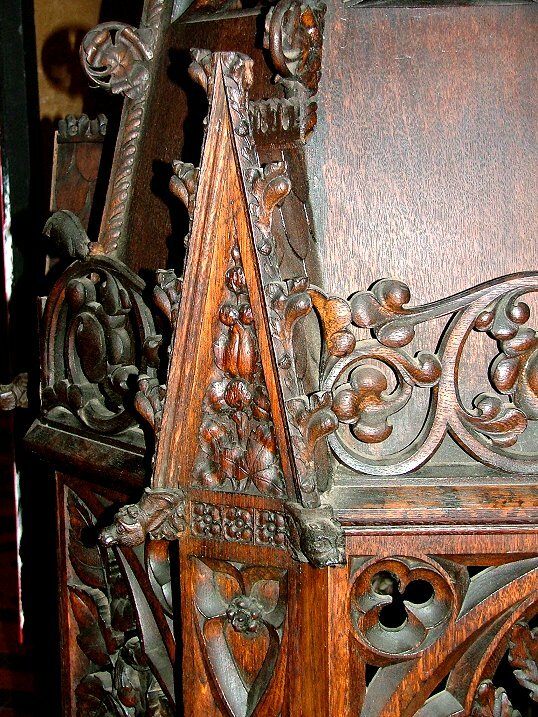 The wood is a delicious chocolatey brown, as evocative of its age as the 14th century screen in the chancel. 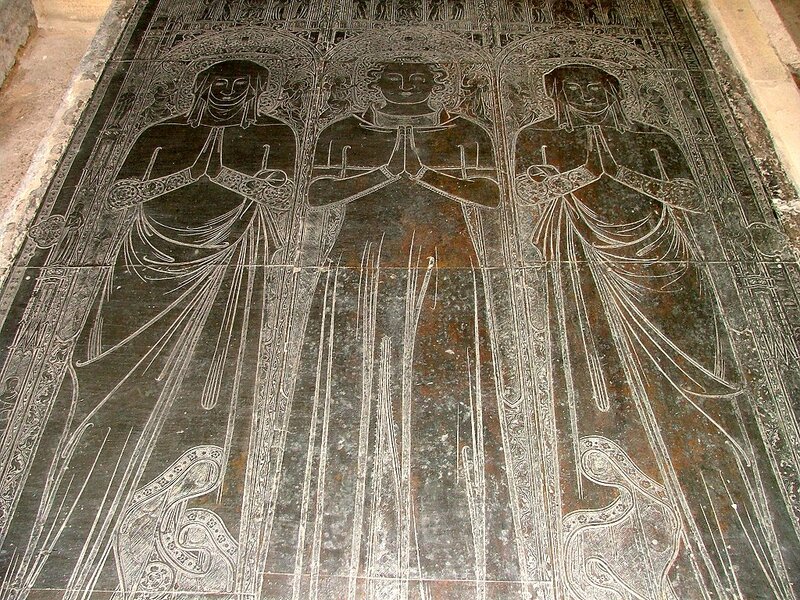 East Anglia's two largest brasses are reset in the south chancel aisle. 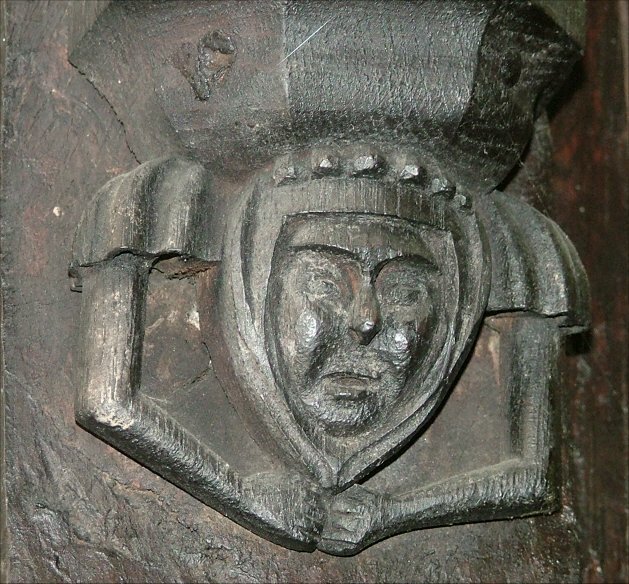 They date from the middle of the 14th century, immediately after the Black Death; they depict former mayor Adam of Walsoken, who was carried away by it, and Robert Braunche, who was himself mayor at the time. 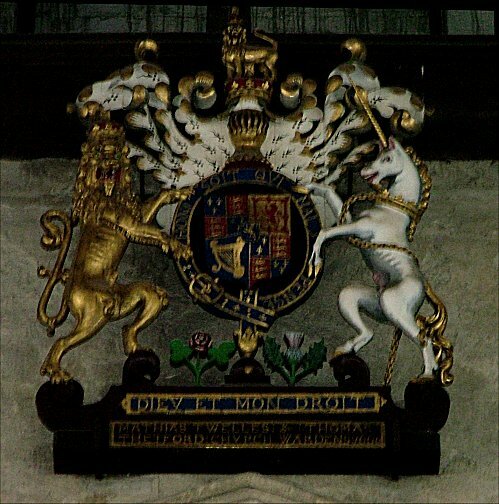 They are not English brasses, but Flemish, being uncut latten plates, and reflect Lynn's links with the continent. 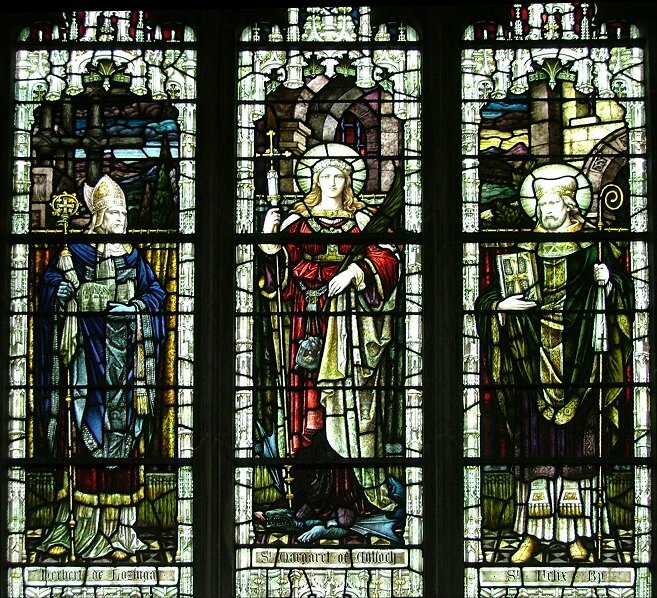 Each man is depicted with his two wives; either bigamy was a privilege extended to burgesses of 14th century ports, or the first died and each man then remarried. 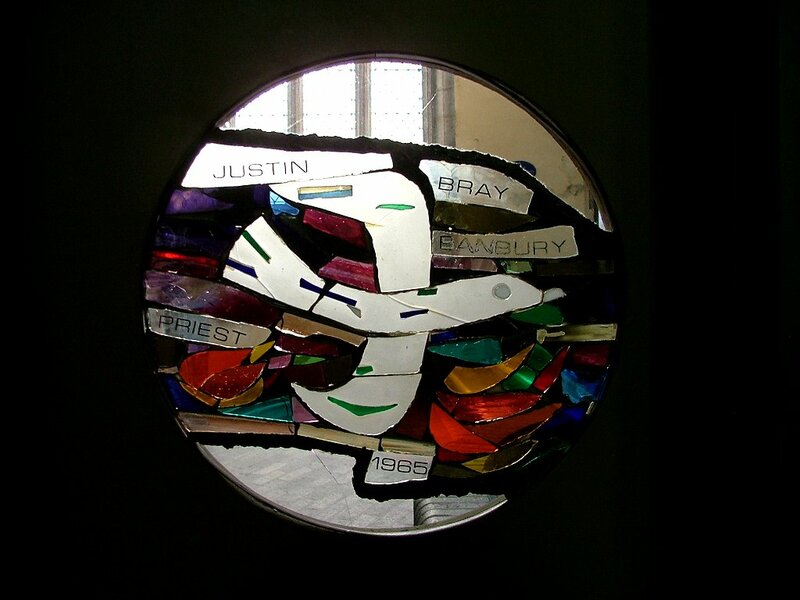 The plates are about two metres tall, and there are elaborate illustrations at the feet of the figures. 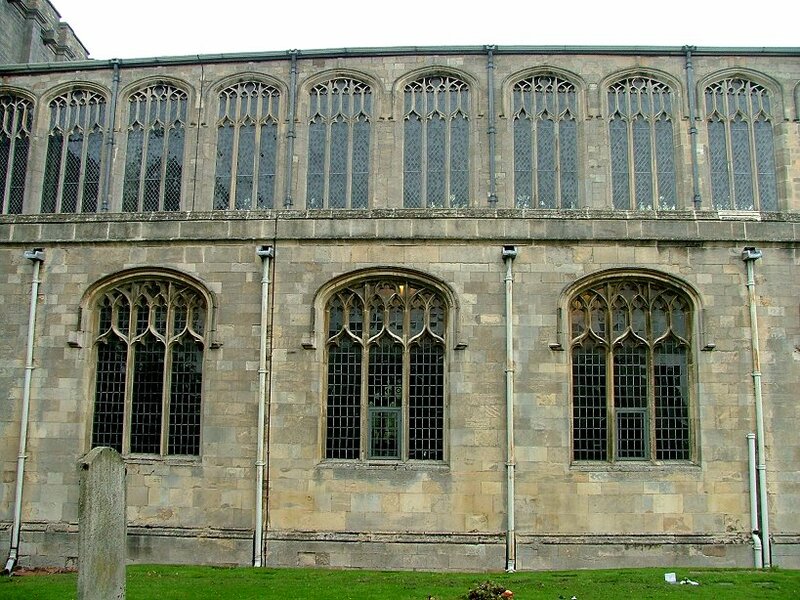 St Margaret is a pleasing church to visit; it is not a complicated building, but repays time spent poking into its corners. Peter and I were in here for nearly an hour without getting bored. 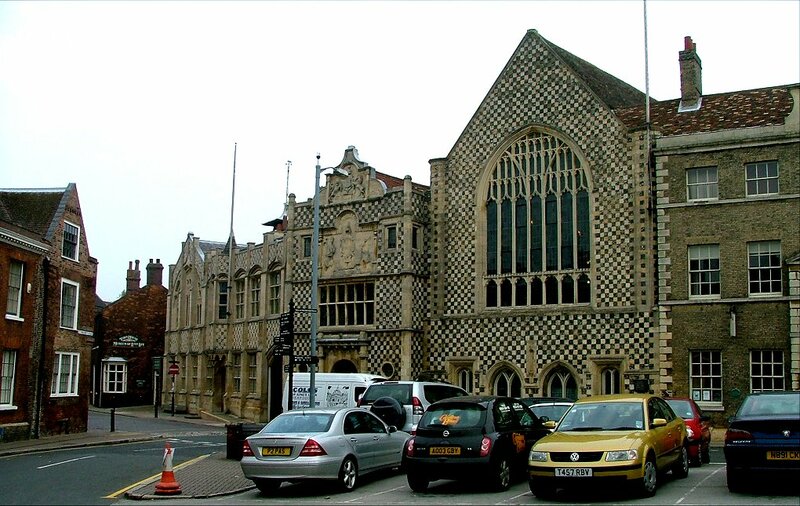 As with many big, Victorianised buildings, there is not really much of an atmosphere; but unlike the Lavenhams of this world this is not a pompous building. 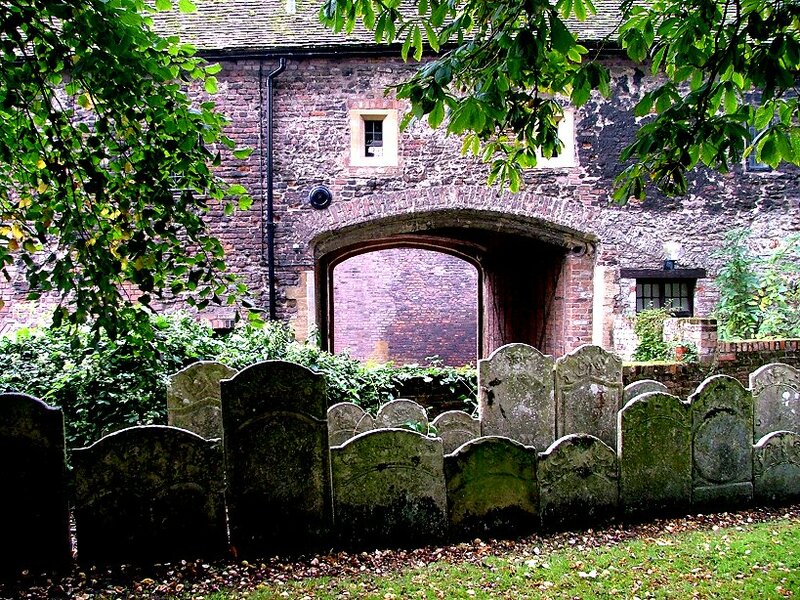 It has a feel of the thousands of ordinary townspeople who have known it over the centuries as their church; less a matter of civic pride, than recalling busy lives lived in its shadows.